New Candy Picks You May Have Missed! I am writing this post while curled up on the sofa, wrapped in a warm blanket, my mind and body swimming with sugar, surrounded by piles of empty wrappers. Yes…it’s Halloween night! I’ve consumed enough Laffy Taffy to giggle for days, and enough snack size chocolate bars to build a buffet. You might assume that having eaten more than my share of sweets, they would be the furthest thing from my mind, yet that is simply not the case! 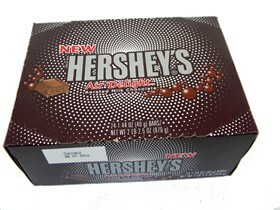 But instead of thinking of the traditional Halloween candy, of which I have just immensely partaken, my mind is on the Halloween candy of the future. Or, more specifically, the new candy of today that may become the traditional candy of the future. 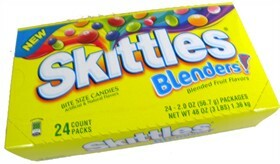 Skittles Blenders – As far as I’m concerned, with the possible exception of the green ones (sorry, green fans! ), original Skittles are pretty much perfection in the non-chocolate category o’ candy. They’re my go-to favorite at the movies, I NEVER get tired of them, and even after all these years I can’t decide if I like the red or purple better. Ahh, they’re both so good! And the orange, and the yellow… Yes, original Skittles will make my ‘5 Candies You Can Bring to a Deserted Island List’ every time, no matter what. But for as strongly as I feel that the original is their best work, I have to admit that I’ve recently been more drawn to Skittles Blenders. It may be the rush of a new romance; the way the Melon Berry Burst makes me feel young again! It may be their brilliantly bright colors. It may be the way they dance across my tongue, exploding in a fruity splash of Skittles-tastic-ness! Whatever it is, please don’t tell original Skittles. I’m sure I’ll return to my true love one day, but for now I’m rather enjoying my Blenders adventures! It’s October 24th. Do You Know Where Your Halloween Candy Is? For as quickly as September slipped away, October went and won the race for speed! Even if these last 7 days trickle by like molasses, this month will surely come out on top for fastest. But just like December, October holds one of her most exciting days for the very last day of the month, and with that happy holiday on the horizon, we can’t quite find it in ourselves to complain that the month is almost over! 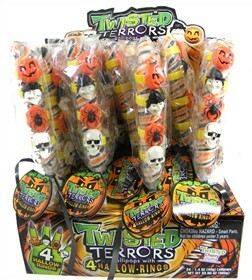 Glow Stick Pumpkin Lollipops – When it comes to trick-or-treating, the only thing that’s more important than having fun is being safe. The simple fact is that it’s getting dark earlier and earlier, and the brighter your costume and accessories the better. 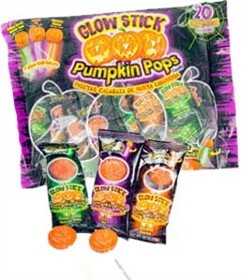 These lollipops help make it a bit easier to be seen with a stick that snaps and glows like a traditional glow stick. Kids should still carry flashlights and wear reflective gear, of course, but this adds a little extra illumination that’s also just plain cool! Sugar Free Peeps: A New Halloween Candy Must-Have! It’s no secret that candy can be a sweet part of a balanced diet, whether you are on the path toward losing a few pounds, working to maintain your current weight, or are simply mindful of everything you eat on the journey to be as healthy as possible. What most of us have learned, whether we like it or not, is moderation is key! It turns out there is a difference between one serving of Peanut M&M’s and one bag of Peanut M&M’s. Oops. And as we all know too well, M&M’s are far from the only candy that makes a limit a tricky task. One other such treat is marshmallow Peeps. Sure, we open the package knowing we should just have one or two. We open the package with the best of intentions. We open the package thinking, “These Peeps will last me a week! I will have no more than 2 per day, because I have self control!” But…that doesn’t always happen. And it’s not our fault! Once that ooey-gooey goodness touches the tongue, stepping on the brakes is so hard. Once that plump, pillow of sweet marshmallow finds its way to your mouth you are no longer responsible for what becomes of the package of Peeps. You are only human! Since the dawn of time, humans have been no match for marshmallows. It’s just science! Halloween Candy Classics: Let Them Eat Chocolate! As deliciously untradeable as you and I may think they are, there will always be kids willing to take Mary Jane Candy and Gobstoppers to the Halloween bargaining table. It won’t be all of them, of course…but it will be some. And it won’t just be Mary Janes and Gobstoppers. There will be Smarties open for candy negotiation, Sugar Daddy lollipops awaiting a switch, Tootsie Pops added to the auction. And why would kids be willing to part with these sweets – the very bounty that is their pay for a long night of Trick-or-Treating? For one reason, and one reason only: chocolate. Rest assured that the taste buds of today’s youth are very much intact, and they are fully capable of enjoying each of the above treats just as much as you or me. And, to be sure, almost any other time of year they would gobble them up without a second thought. Trade? What trade? Nom, nom, gone. But to be certain, this isn’t any other time of year. This is the time of year that comes immediately after ‘if I don’t eat this chocolate bar in 30 seconds or less it will melt all over everything within 5 feet of me.’ You know…that time of year! Outside of a well-chilled chocolate bar here and there, fresh from the fridge or freezer, it has been months since we’ve been able to trust a candy bar not to melt into a pile of ‘oh no!’ at the bottom of our purses and backpacks. And in kid months, a few months is at least 4 ½ years. It seems like another lifetime when they were able to leave a Kit Kat in the car! And as such, the fall marks a return not only to school, changing leaves, pumpkin carving and long sleeves – it is also, more importantly, a return to chocolate. And NOTHING holds more value than that at the Halloween bargaining table. If you’ve already got all the candy you need for trick-or-treaters, there’s no need to stress if you haven’t included chocolate bars in the mix. They may trade some of their stash for chocolate, but will surely partake of other favorites as well. And once chocolate fever has calmed down a bit and they are more accustomed to the chocolate-friendly temperature, their universal love of all candy will return! 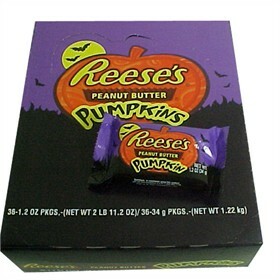 But if you haven’t got all your Halloween treat sacks packed just yet, consider adding some Fun Size Snickers, Reese’s Peanut Butter Pumpkins and M&M’s. Chocolate candy currency has never been worth more than it is now, and you could make the trick-or-treaters that find their way to your house the ‘richest’ kids in town.